Enhance hair follicular density improve tensile strength of hair enhance hair growth. "BYUTIKA" Ayurvedic Hair Growing Gel is 100% Ayurvedic Gel which helps to grow rejuvenate hair on bald surface of head. 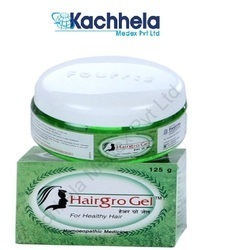 Byutika's Ayurvedic Hair Growing Gel has helped many people to regrow hair on bald surface. We manufacture & supply this product with special orders. Hibiscus flower better known as Jaswand in sanskrit is loaded with antioxidants, proteins and amino acids which nourish the scalp and hair. This Jaswand Hair Gel incorporates Jaswand (Hibiscus) extract which helps reduce hair fall, split ends, early greying of hair and promotes hair growth by providing nourishment to them. Being a client centric organization, we are involved in manufacturing and supplying a wide range of Psoriasis Cream in high end cosmetic companies and Pharmaceutical companies (Dermatologist ) . In order to cater the variegated demands of our precious clients, we are offering an excellent quality range of Hair Regrowth Gel. Mustard seed oil is an excellent hair vitalizer and thus promotes healthy strong hair. It provides blood circulation and increases the hair growth rate. This is an excellent product in gel form for people who lose hair due to the inflammation of their hair follicles. People might suffer heavy hair loss due to the continuous inflammation of their hair follicles.The follicles might get inflamed due to several reasons. This product restricts hair fall due to inflammation to a very great extent. Used for: Daily application on hair to encourage hair regrowth and stop hair fall. Exotica hair growth gel is a combination of rosemary and cedarwood essential oils helps to promote hair growth. Jojoba oil and Aloe Vera gel keep the hair follicles in the scalp healthy. (Man-Woman Sporty Hair Style Beneficial & Natural Hair, Natural Organic Essential Oil Blend ).